The National Hot Rod Association and the Harley Davidson Motor Company are ready to rumble in more ways than one. The rules are up, and the racing schedule is posted for the inaugural NHRA – Harley Davidson Drag Racing Series (Harley Davidson DRS). This racing series will be run at select NHRA Lucas Oil Drag Racing Series events during the 2013 season beginning in March. 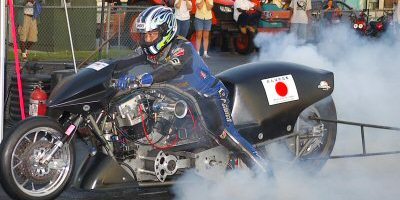 Tak Shigematsu, of Blue Panther HD in Japan will be driving this Top Fuel Harley tuned by his buddy DJ in NHRA competition during the inaugural Harley Davidson Drag Racing Series in 2013. Tom McCarthy photo. Ten races will be contested this season. Racers will have their best point totals from seven of ten races counted to their year end points, in pursuit of their respective national points championship totals for their class. The five Harley Davidson classes to be contested will be Top Fuel Harley, Pro Gas, Draggin’ Bagger, Street Pro, and Hot Street. This NHRA Screamin’ Eagle Championship Racing Series offers racers a total purse of $152,800 in payouts among the five classes. The winner in each class at each race will receive an NHRA “Wally” along with a check in full NHRA winner’s circle activities. It should be noted Craig Tharpe, who ran the AHDRA for years will be an advisor supporting the NHRA Harley Davidson DRS and is slated to be at all ten events. It’s currently not clear exactly what Craig’s job title will be, but rest assured, in 2013, I don’t believe Harley drag racers will have any trouble finding Mr. Tharpe in the pits or when the NHRA starts awarding Wally trophies in the winners circle. Now to up the ante. It’s come to my recent attention that racers are contacting their NHRA Divisional Directors in support of the new NHRA Harley Davidson DRS picking up the old AHDRA class of “Pro Dragster.” I’d like to weigh in on this matter. I’ve been a fan of the now defunct AHDRA sanction’s class of Pro Dragster (P/D) for many years. It’s the entry level class for motorcycle drag racers who seek to learn the in’s & out’s of nitromethane powered motorcycle drag racing. The rules of P/D as set forth by the AHDRA are simple; engine size is restricted to not greater than a 120CID motor, push rod only, fuel delivery is restricted to carburetor only, no transmission allowed, direct drive only. 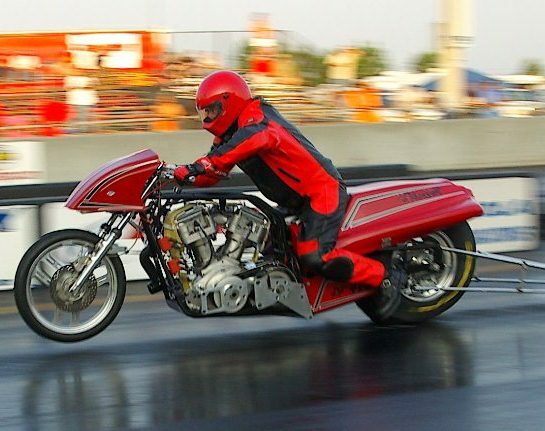 This is close to the basic combination that brought Harley-Davidson fuel drag racing into the NHRA’s spotlight in 1971 when Joe Smith won the historic “March Meet” that very year. Single engine, a carburetor, direct drive and hang on! This is the very combination Joe Smith used to bring motorcycles into the 8’s for the first time at the 1971 NHRA Gas and Fuel Championships. Joe’s bike laid the ground work for today’s P/D and in fact all Top Fuel bikes. I’ve no doubt in my mind that if Wally Parks was here today, he’d agree with me these are the kind of drag bikes that drag racing fans want to see most. They leave the starting line with the thunder only nitromethane can generate, they carry the front wheel dangling in the air till half track or longer, and they generally produce ET’s in the mid to low 7’s with speeds at over 175mph on the average run. Fans LOVE these drag bikes. Because of their simplicity and their decades of development, parts breakage and oil down issues are normally very infrequent. 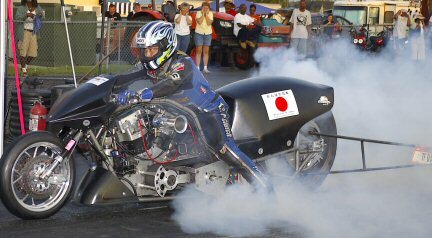 Steve Pleasant, in Pro Dragster competition, hopes his bike will see action in the 2013 NHRA Harley Davidson Drag Racing Series. Tom McCarthy photo. I’ve no qualms about the NHRA and Harley Davidson’s choices for their five premier classes to be run at the ten races set forth for the 2013 season except to say that Pro Dragster should not be overlooked. Their numbers are many across the nation and filling a full field on race day should not be a problem in my opinion. If any of the NHRA Divisional Directors have any questions on this class, I’d respectfully like to direct them to Mr. Craig Tharpe who headed the AHDRA sanction for over a decade and Craig can answer all questions with great authority. Now that motorcycle drag racing has surfaced in NHRA drag racing and will be contested during some of NHRA’s biggest shows, it makes sense to me for motorcycle drag racing to put its best up front. I don’t think anyone can argue that Pro Dragster is one of the best spectator draws in drag racing today. There are many factors that go into the NHRA decisions to pick up or drop any class. There can be no class to race in if the racers have nothing to race for, so class sponsorship is a must. Also there are rule considerations to be reviewed. Now that AHDRA is defunct, if the class is to be incorporated into NHRA drag racing, whatever specific rules the AHDRA was using will have to be reviewed by NHRA Tech. Changes may be necessary to meet NHRA drag racing standards. Will Pro Dragster be added to the 2013 NHRA Harley Davidson DRS? Time will tell. I encourage all motorcycle drag racers with an interest to respectfully write via email to their respective NHRA Division Director and weigh in on the matter. What was your source for this info? It has been posted in several areas that the only points and championship would be for Top Fuel. Unless Kris Schoonover’s name is associated with it I would doubt any statement. I have been getting conflicting stories from the different division reps so what are we to believe? Another example is just in this article the series is called 2 different things. The series changed its name after the 2012 announcement from NHRA Lucas Oil Screamin’ Eagle Championship Racing Series to the current NHRA – Harley Davidson Drag Racing Series. That is unless previously published reports are incorrect. Not picking on anyone, just trying to show how much disinformation is being published and spread around. Tom, the biggest problem so far talking to Schoonie is that the Division Offices are not informed and up to date. Also there are a “LOT” of bugs to be worked out. Registration fees is one of them. The lower 3 classes require you to win just to pay the registration fees and 1 additional pit pass, based on information that the division offices are giving out. Another is limiting the number of bikes a rider can race. The issue with adding the PD class which I whole heartedly think is a great idea, brings up more considerations. Like where are they going to find the extra $23,250 for the purse for 10 races? The purse structure was to imitate the 2012 AHDRA season. $23K is a a lot of cash and you certainly can’t take it away from the other 5 classes. Schoonie and the NHRA have some bumps in the road ahead but I’m sure that they can work them out if they really want this series to make a go of it. Attention Racers: The June 19-21, New England Dragway, Epping NH race date has been amended on the NHRA website to read JULY 19-21. Be alert for changes by watching the NHRA web site for the NHRA Harley-Davidson DRS schedule. Thank You TMc.